The Old Lady, first, is important to the adult ballet class (“adult” here carries not a hint of eroticism). The Old Man also occasionally makes an appearance, though because he is frequently outnumbered or simply alone, his is a quiet presence. The Old Lady ranges in age from late forties to early eighties, her title used primarily because of the contrast she provides to most students at a ballet school. She and her fellow Old Ladies can make up as much as forty percent of any given class. She may be attending because it was the joy of her youth and now she can return to it at her leisure. It may be an intrinsic aspect of her exercise regimen, supplemented with Pilates and perhaps Zumba. Not every Old Lady is motivated by nostalgia or endorphins. Sometimes she has built up a brood of Old Lady friends. They lean their forearms on the barre and discuss children and home additions, brought back to class again and again by the companionship that blossoms between breaks in the music. The Old Lady contingent is good for morale. Some may be irritated by their chattiness, their indifference to musicality, their total lack of spatial awareness. Someday, though, all dancers join their ranks, grasping the barre with gnarled fingers and lifting unpointed toes just barely off the floor, too deaf to notice the piano but sure, so sure that dance will never leave the body. The presence of the Old Lady, the future, is tempered by the frequent attendance of the Student, the past. The Student also takes adult class for a variety of reasons. Perhaps her training program is off for two weeks after Nutcracker performances, and she wants to stay in shape; perhaps she is visiting from another city, and takes class to stay in shape; often she is neither of these, but a current student at the same studio, and she takes class twice a day, to stay in shape. Students take class. Always take, never go to, never have—they take the experience into themselves, drink it, capture it, keep it—because it is the timepiece for living. The barre is as familiar as the dining room table, more welcoming than the desk. A week without ballet class has the same feeling as the first week of summer vacation: disorienting, aimless. The Student stands out for her discipline and adherence to ballet class conventions. Her hair is frequently in a neat bun, perhaps pinned and hairsprayed. She wears a leotard and tights, the inescapable, universal ballet uniform ideal for identifying misaligned hips, observing muscle groups, and crippling self-esteem. (But because she is taking adult class, the Student is probably wearing black tights instead of pink, worn fashionably over the leotard and rolled low on the hips). The Student lends an earnest note to the adult ballet class. Her movements are precise and musical, arms gracefully supported but airy and relaxed even as her legs move with lightning speed. Every head and hand movement is coordinated, in sync with the piano, even when the combination has just been demonstrated for the first time. If her pirouettes are off that day, the Student will spend time in the corner of the studio, practicing the turn again and again, her head whipping around to spot her own fierce face in the mirror, one, two, three times before landing. She will always stretch carefully before and after class, not unaware of the envious glances directed at her from the Old Lady cluster nearby. Indeed, the Student demographic may heighten the tension of the adult class atmosphere. This is especially the case if the teacher is prone to pay more attention to these participants than to others—which, of course, he almost always is. (For mysterious reasons, teachers of adult ballet classes tend to be male.) He is captivated by the presence of a work-in-progress, a student in line for performances and maybe even a career, so he will shower the Student in corrections. 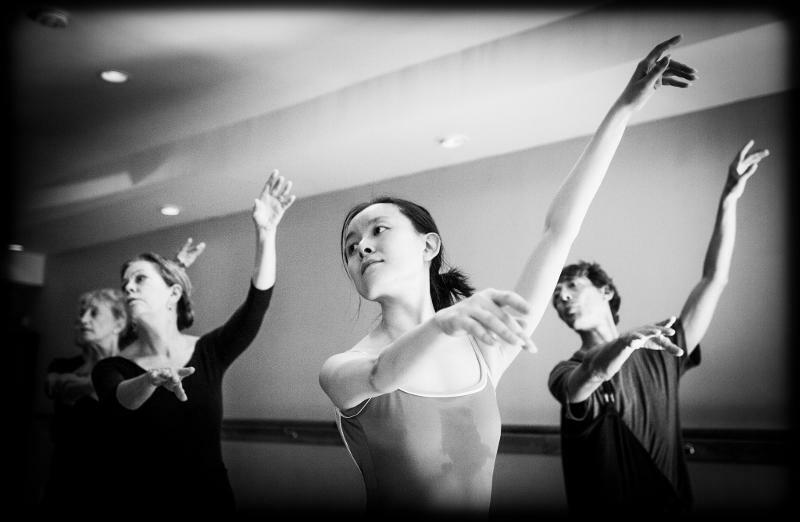 And corrections to technique, in ballet class, are signals of a teacher’s admiration; dancers who are passed by without comment are beyond help. This degree of attention is often disgruntling to the Old Lady, as she and her friends faithfully worship the Teacher, laughing at all his jokes, clustering around him like preening hens. Interestingly, the Old Lady is not disgruntled by the presence of and attention received by the Professional, another common demographic of the adult ballet class. The Professional, like the Student, may be in class because she is off-season—in which case she is simply taking class because it is her life’s work—or she may be coming back from an injury, in which case she must take a class below her normal company level to ease herself into recovery. Because there is nothing in this world so beautiful as a good arabesque, and because that is why I’m in class, in my faded leotard from the tenth grade and my ill-fitting sweatpants. Here I am, the Lost Dancer: nowhere near a Student (not anymore), light-years away from the Professional, but still beyond the gentle interest and rudimentary technique of the Old Lady. The Lost Dancer is the unmoored dancer, who knows that life has moved forward, outward, upward without ballet, but who cannot bear to leave it. We are legion, found in classes the world over, standing at the back of the room. For the Lost Dancer, adult ballet class is pleasure and pain. Pain because visions of Sugarplums dance in her head all months of the year, choreographed and set to music; pain because she knows that when she chose college over dance, she closed a door that has sealed and will not, will not open again; pain because she might always wonder what was over its threshold. Pleasure because of this: there is a moment before every combination, before the pianist plays the opening notes that start every dancer’s metronome, when we wait in fifth position. Then as the teacher says “And” to signal the music’s beginning, we move one arm in preparation—a gentle extension from the elbow, six inches, a bit more. Just a breath. Just that. This entry was posted in Issue 17:3 and tagged Creative Nonfiction, Laura Marostica by TC Editors. Bookmark the permalink.